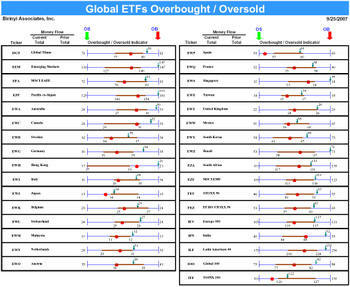 Below we highlight some of the global ETF that have had large moves recently versus their "normal trading range." The range is highlighted as the red line, the bounds for each ETF represent theoretical highs and lows, while the arrow is the ETF's closing price as of 9/24. To receive this report daily, including the most extreme S&P 500 and 400 names, try the Birinyi Mini-Institutional Service. Hello! I have a story I'd like to share. Can I get an email to send it to?